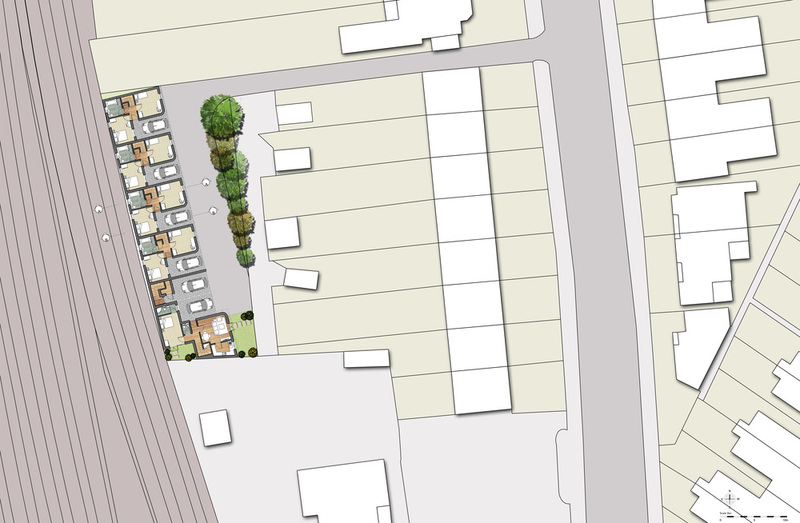 Currently used by a local building contractor as a joinery workshop and storage facility, this scheme looks to convert the site into residential use providing 4 No: 3 Bedroom town houses and 2 No: 3 bedroom apartments. It has a very narrow entrance and driveway, which can not be improved, it has railway lines to the west and a water works to the south. The remainder of the surrounding area is residential. This scheme has been developed for the Pre-App discussions with the planning team and has pushed the development potential to the maximum we believe may be possible. 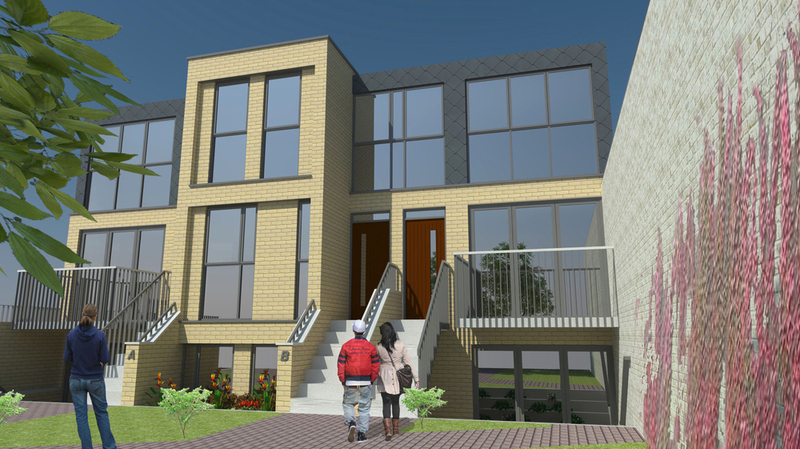 The design of the houses over 3 floors, places the main living floor at First Floor, with terraces and gardens set at all levels, designed to be protected from the noise of the trains and to avoid overlooking the existing houses of Conyers Road. Whilst an awkward site, we believe it offers a great deal of potential for something special to happen. A new development of 6 No: 5 bedroom houses is proposed for this site which currently has only 2 family dwellings. 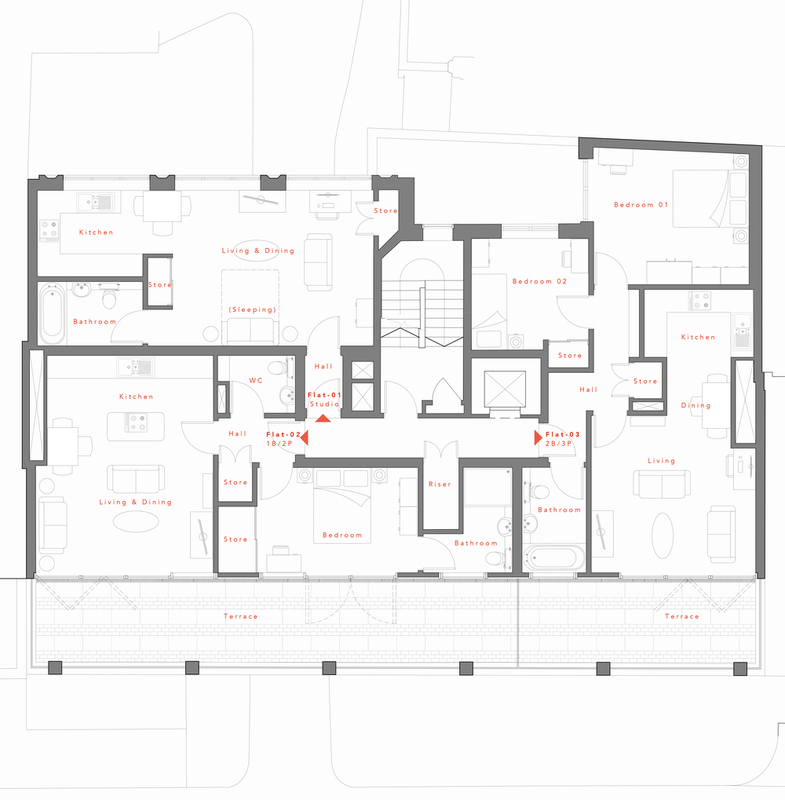 Designed over 3 floors, but with the top floor tucked into the roof, enables these large homes to fit with the scale of the surrounding houses. The design is a contemporary take on traditional forms and materials so that the buildings represent the age they are built in, whilst reflecting the materials, scale and character of this suburban location. 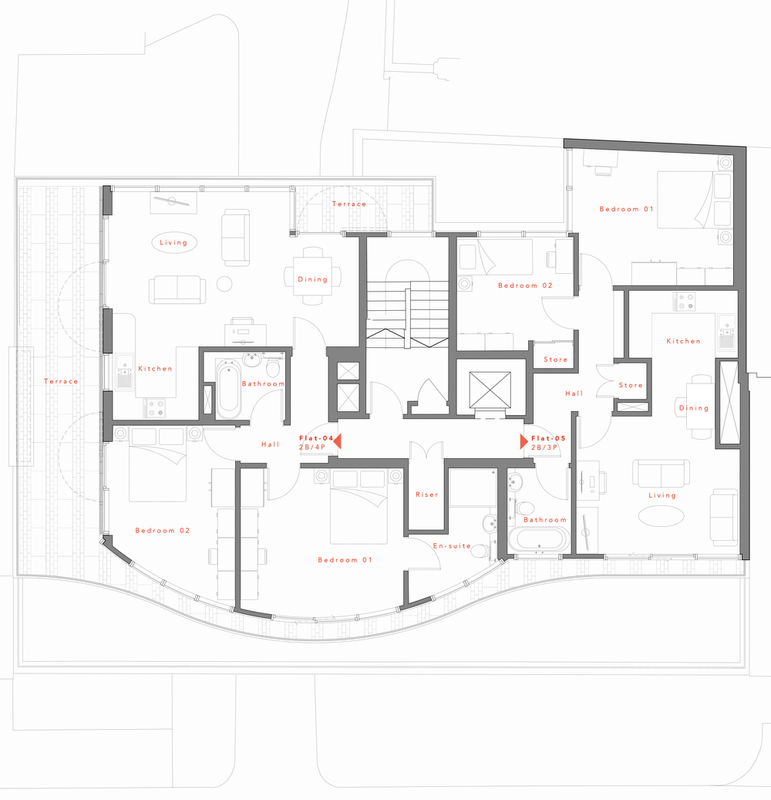 Each house has off-street parking and side access to their private rear gardens and proposed bicycle stores. The new houses will be set back from the main Uxbridge Road, accessed through a small private road serving the adjoining properties. 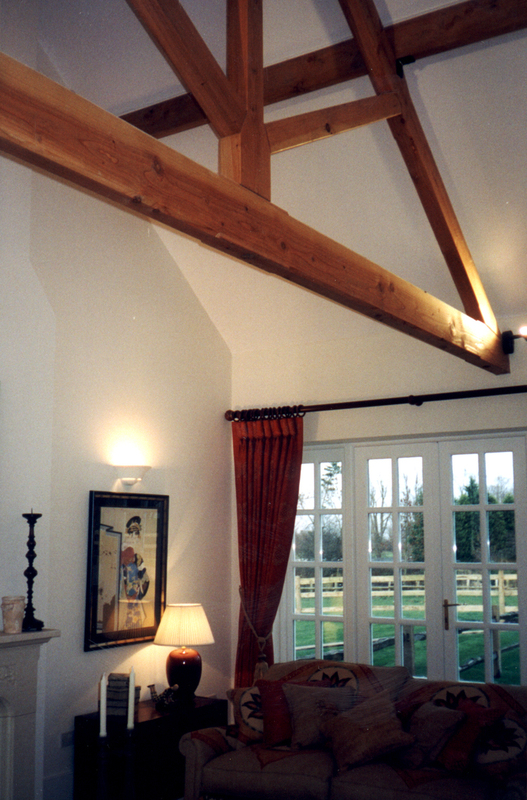 This scheme created 10 new dwellings through the conversion, re-build and minor extensions to a group of disused farm buildings. On the edge of the built up area, it provides these homes with all the necessary amenities families need, yet allows idyllic views over the surrounding countryside. 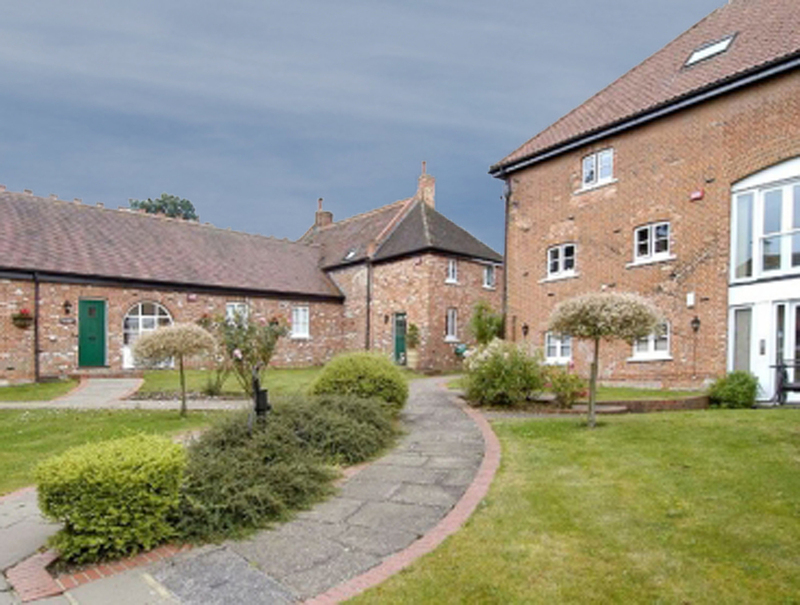 A mixture of apartments, bungalows and houses provide a range of homes that provide for an integrated community, working with the existing residential units of the original farm. At the heart of the development is a garden area, shared by all, but with the majority of units also benefitting from a private garden. Cars are restricted to the outside areas, providing an peaceful hub for residents to meet and share in activities. 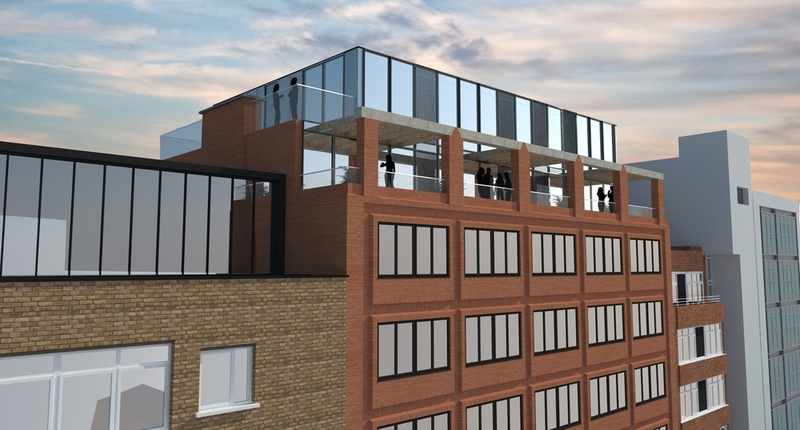 This project proposes to convert an existing Gymnasium on the first and second floors, together with a new roof top extension, to provide 7 new residential apartments. 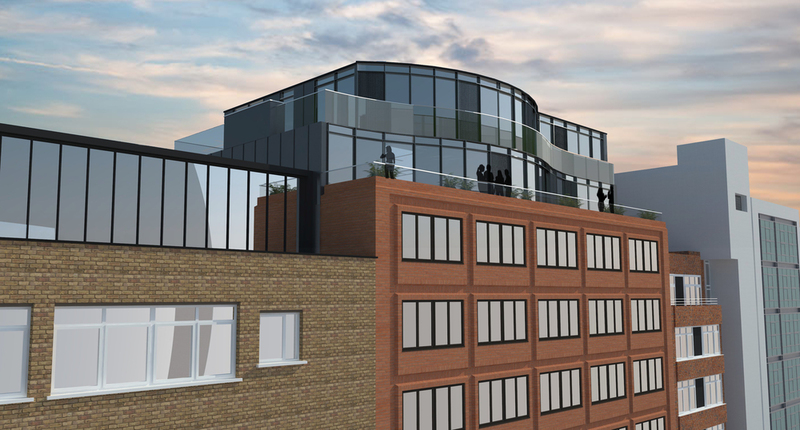 The design will provide a range of units, from small studio apartments up to a large 3-Bedroom penthouse apartment on the roof, benefitting from great views over north London. The site is situated in the heart of Palmers Green town centre, close to good transport links, shops, restaurants and local facilities. Many of the surrounding buildings have residential accommodation above the retail units at ground level, providing an established community in this part of the town. 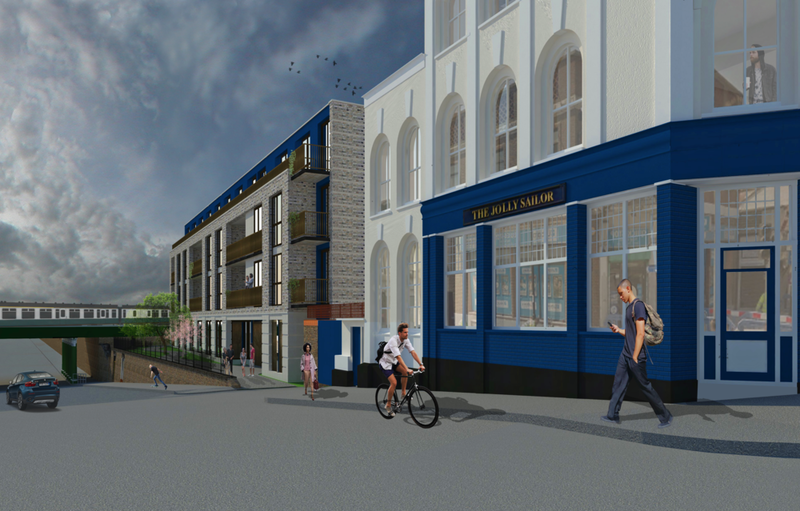 Planning Permission has been granted for the proposed change of use from Office B1 to Residential C3 for this difficult site on Willesden High Road. The client and previous owners had attempted to gain permission for this change of use, following an earlier lapsed consent given in 2008. 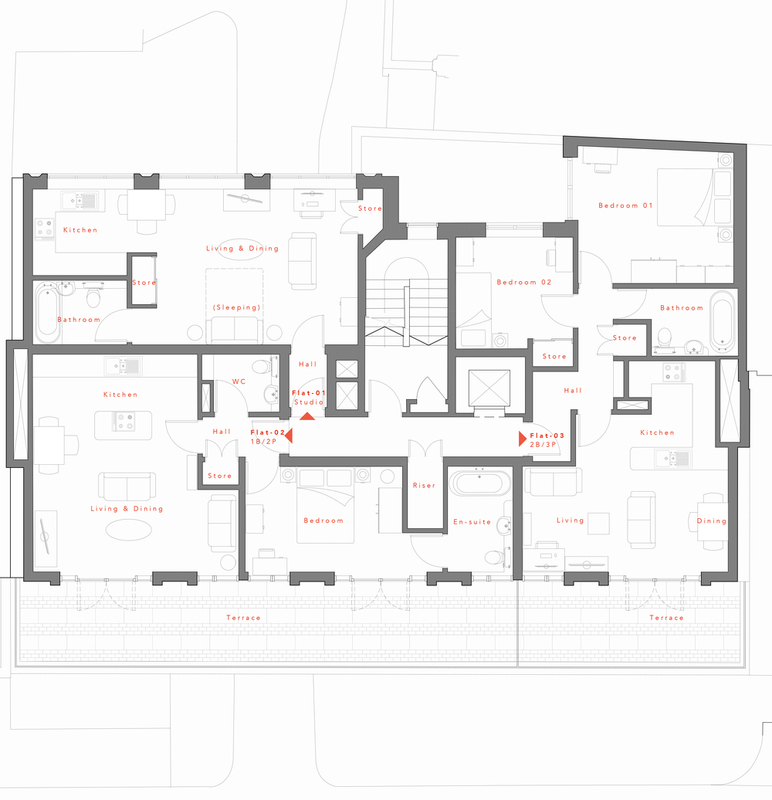 These applications were unsuccessful for a number of reasons, but whilst already working with Studio M12 on another project, the client decided to give it one more go, with us leading on the design and application process. 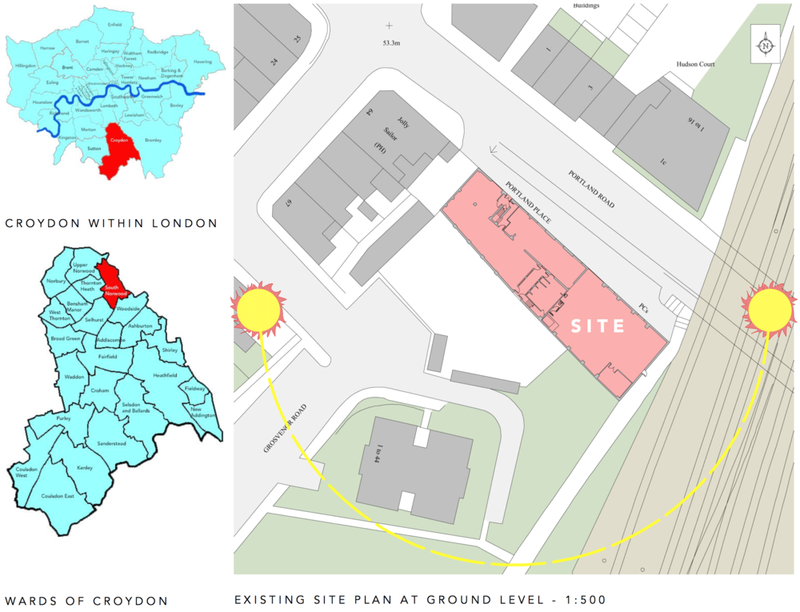 Through careful consideration of the original approval, together with negotiations with the Planning Team at Brent Council, we were able to provide a scheme that both fulfilled the client's brief and complied with all the relevant planning policies and previous concerns. This development will hopefully act as a catalyst for the redevelopment of other potential sites in the area, including the adjacent playground. 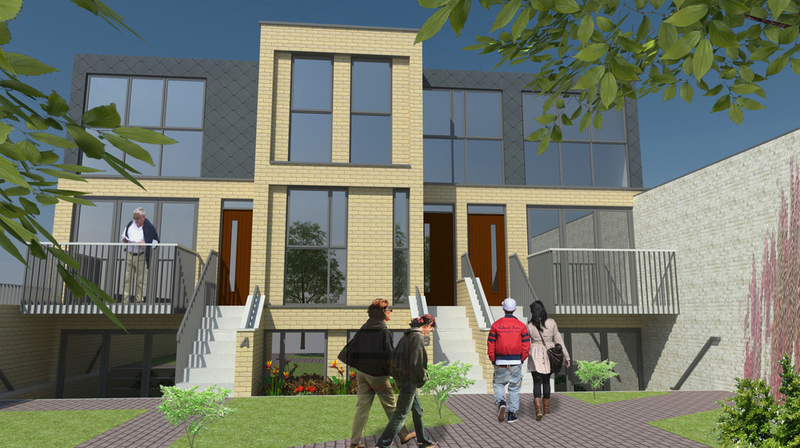 We worked closely with the land owners, the adjoining developer and the Planning Department over a two year period to develop the design for this site, now submitted for Planning Permission. The site is close to South Norwood Station, in the heart of a conservation area and next to the famous Jolly Sailor Public House. 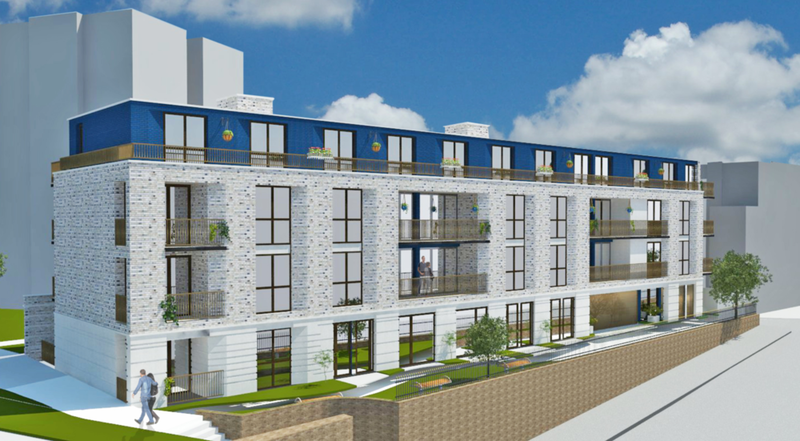 The development will provide a mixed use scheme, retaining a commercial use over much of the ground floor area, together with 19 new 1-Bed and 2-Bed apartments. The building completely covers the whole site area, with the current access road along the front being converted into a linear park, making peoples walk to the station a more pleasant experience. The WC’s tucked under this road, we are suggesting, becomes a coffee shop as the area is lacking a good one. A joint application has been made between the current land owners and Wandle Housing Association to provide 13 new apartments in this historic part of Mitcham. 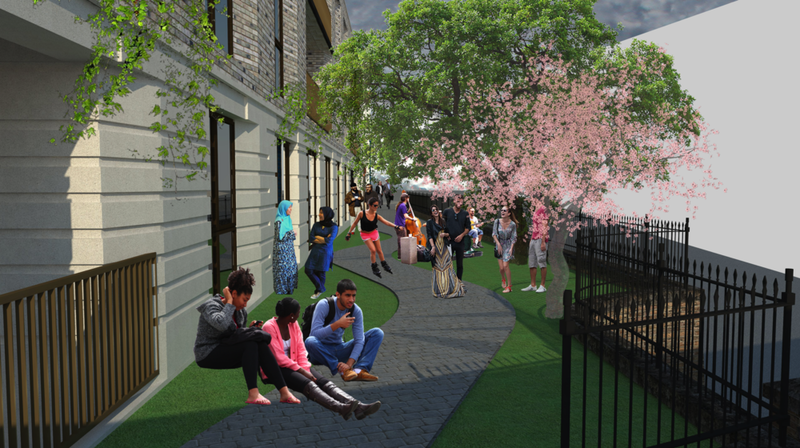 Sitting within the Cricket Green Conservation Area, the project will produce new homes to be sold on a shared ownership scheme in an area where new homes are scarce. 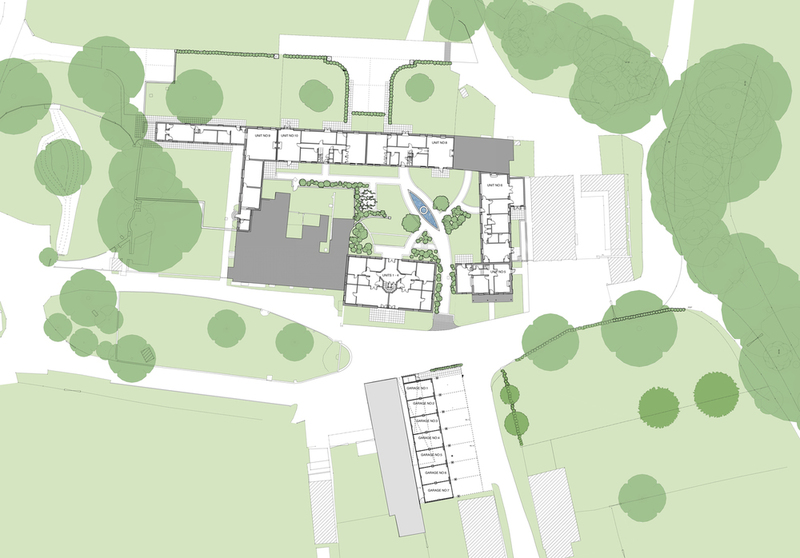 A mixture or 2, 3 and 4 person homes are planned within a built form that reflects the older character of the area, rather than the more recent buildings that sit adjacent to this site. 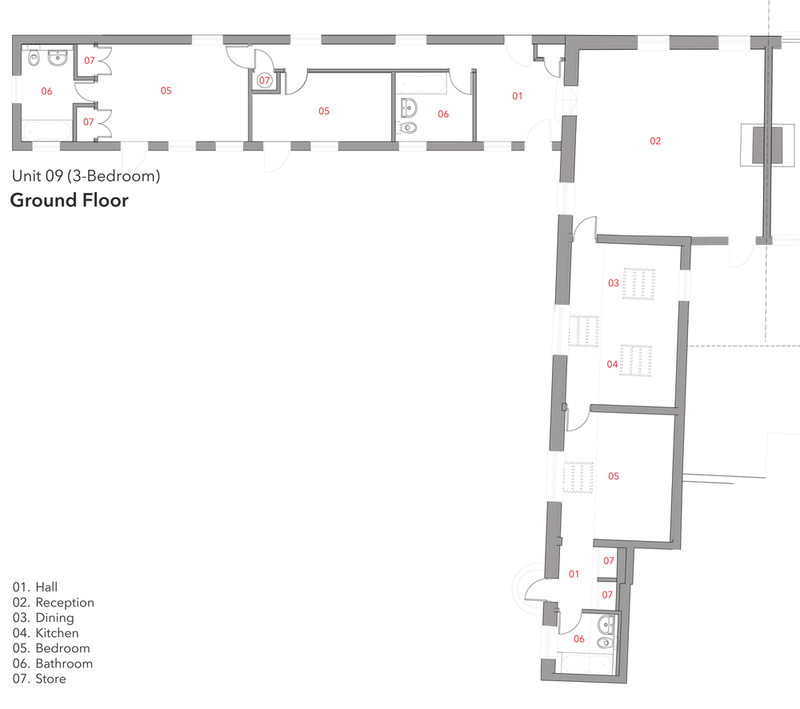 The accommodation is in a part 2 and part 3 storey building, with the massing used to form a cluster of what looks like 5 old houses. There will be a well landscaped garden to the north East, with improved parking for Beadle Court as well as the new homes to the South West.